Our experienced personal injury attorneys take great pride in having the legal skills and resources to handle the most complicated personal injury and wrongful death cases. If you have been injured, call us today for your free initial consultation. Our social security disability attorneys fight to help our clients obtain the social security disability benefits they need. If you have been denied benefits, call one of our experienced disability attorneys today for your free initial consultation. From serious felonies to misdemeanors and traffic offenses, our criminal defense attorneys have a fine tradition of aggressively protecting the rights of their clients. If you are going through a divorce, custody dispute or other family law issue, our trusted family law attorneys have a clear understanding of your rights and have been achieving results for our clients for nearly 50 years. PERSONAL INJURY If you have been injured, call us today to schedule your FREE INITIAL CONSULTATION. Our experienced personal injury attorneys have a reputation for thorough and aggressive representation of our clients and, as one of the area's largest litigation firms, our firm has the resources to handle the most complicated cases. SOCIAL SECURITY DISABILITY If you have been denied social security disability benefits, call us today to schedule your FREE INITIAL CONSULTATION. Our social security disability attorneys know what is required by Social Security regulations to prove a disability and will pursue all options available to help our clients secure the benefits they need. For more than 50 years, the experienced personal injury attorneys at Gottlieb, Johnston, Beam, and Dal Ponte, P.L.L. have represented individuals, families and workers in Zanesville and Southeastern Ohio who have been physically and financially injured as a result of the negligence of others. Our attorneys have worked hard to earn a reputation for thorough and aggressive representation of our clients. As one of the area's largest litigation firms, our personal injury attorneys take great pride in having the legal skills and resources to handle the most complicated cases. If you have been denied the social security disability benefits that you need, you should contact Gottlieb, Johnston, Beam & Dal Ponte, P.L.L. today to schedule your free initial consultation. It is of the utmost importance that you have an attorney fighting for your interests. Our experienced social security disability attorneys are familiar with what is required by Social Security regulations to prove a disability and will pursue all options available to help our clients secure the benefits they need. Gottlieb, Johnston, Beam & Dal Ponte, P.L.L. has a strong history of representing businesses of all sizes, from small start-up operations to medium and large companies. Our firm has offered business law related services to since its formation in 1962. Gottlieb, Johnston, Beam & Dal Ponte, P.L.L. has provided legal counsel and guidance through the difficult maze of divorce and child custody for nearly 50 years. We continue to focus on achieving the results that our clients want and are entitled to. Our experienced attorneys and skilled staff will focus on your individual needs and remain committed to accomplishing your legal objectives. Estate planning includes the preservation and the distribution of your assets, both during your life and upon your death. The attorneys at Gottlieb, Johnston, Beam & Dal Ponte, P.L.L. have decades of experience helping clients accomplish their personal and family goals, ease the management of their financial and legal affairs and minimize taxes. We can not only help you create a plan to cover how you will be cared for if you become physically or mentally unable to care for yourself, but also fashion an estate plan that ensures that your wishes will be carried out after your passing. With more than 50 years experience, our attorneys who live and reside in Muskingum County have a wealth of knowledge and experience handling commercial and residential real estate issues both in this county and all adjoining counties. Whether you are in need of a purchase agreement, a title exam or the writing of a lease, we have the dedicated staff and experienced attorneys to handle all of your real estate needs. We will also be there in the event that a dispute arises, with the skill and knowledge that can be used to resolve such disputes, either before trial or at trial. For more than 50 years, the experienced personal injury attorneys at Gottlieb, Johnston, Beam, and Dal Ponte, P.L.L. have represented individuals, families, and workers in Zanesville and Southeastern Ohio who have been physically or financially injured as a result of the negligence of others. Our attorneys have worked hard to earn a reputation for thorough and aggressive representation of our clients. As one of the area's largest litigation firms, our personal injury attorneys take great pride in having the legal skills and resources to handle the most complicated cases. Whether you are in need of a purchase or sales agreement, the writing of a lease, a title exam or title insurance, our attorneys who live and reside in Muskingum County have more than 50 years of experience handling commercial and residential real estate transactions. And, in the event that a dispute arises involving a real estate matter, we have the skill and knowledge to resolve such disputes, either before trial or at trial. Legal issues can arise at any time. When you, your family or your business need legal assistance, it is important to be able to contact a law firm you can trust. 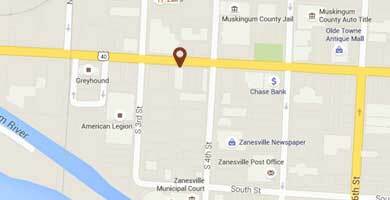 We are a full-service law firm serving Zanesville and Muskingum County for over 50 years. Our attorneys live and work in the community listening, caring and protecting our clients since 1962. When disaster strikes, you can trust this law firm and use its experience and skills to protect your interests. Don A. Dal Ponte has been with the firm since 1972. His major practice areas include General Practice, Civil and Personal Injury Litigation, Business Law, Family Law and Estates. Miles has been a partner with the firm since 1986. His major practice areas include Personal Injury Law, Civil Litigation, Family Law, Social Security Disability Claims and General Practice. Jim has been a partner with the firm since 1988. His major practice areas include Criminal Law, Family Law and Real Estate Law. Phil has been a Partner with the firm since 1990. His major practice areas include General Practice, Probate Law, Business Law, Municipal and Zoning Law and Real Estate Law..
Mark has been a partner with the firm since 2002. His major practice areas include Criminal Law, Family Law and General Practice throughout Southeastern Ohio..
Susan has been with the firm since 2003. Her major practice areas include Estates and Estate Planning, Agricultural Law, Family Law and General Practice. Andrew focuses his practice on handling cases involving serious injury or death arising from auto accidents, premises liability, medical malpractice or nursing home negligence. Additionally, Andrew dedicates a significant portion of his practice to helping disabled individuals pursue the Social Security benefits to which they are entitled. Keith was born in Zanesville, graduated from Maysville High School, and is happy to have returned to his hometown. His major practice areas include DUI, Criminal Law, Traffic Law, Family Law, Veteran’s Benefits, Estate Planning, and General Practice..
Matthew joined Gottlieb, Johnston, Beam & Dal Ponte, PLL in 2018. Matthew’s major practice areas include Criminal Law, Family Law, and Landlord-Tenant Law. Wayne has been affiliated with the firm as Of Counsel since 1990. His major practice areas include Corporate Law, Financial and Estate Planning, Retirement Plans and Tax Return Preparation.. The end of a marriage can be an unforeseen event, but it is important to know the different ways a marriage can be legally ended in Zanesville, Ohio.